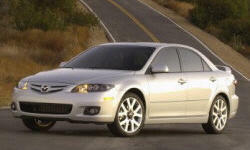 Why the 2006 Mazda Mazda6? Short of buying a sports car, Mazda consistently has the best handling across their product line. The handling in this car may have saved my life last summer. It helped me avoid being crushed between two semis on a difficult stretch of highway in a torrential downpour. I've never been so happy with my choice in car as I was at that moment. The Mazda 6's ergonomics are fantastic. Leather, heated seats power adjust to put you in an ideal position relative to the wheel, dash, and lines of sight out of the car. I've made tons of trips in this car, from short in-city jaunts to multi-hour highway stretches, and it's always a pleasure to be behind the wheel. The 2006 is one of those hidden hatchback designs, where it appears to be a regular sedan from the outside, but the whole back windshield raises on hydraulics with the trunk piece. The best looking hatchback design by far, and combined with the fold down back seats, leads to a prodigious amount of storage space in a mid-sized vehicle. Why Not the 2006 Mazda Mazda6? The only minor complaints I have about this car comes from the engine. It puts out slightly less horsepower than racing engines of the same size, but eats just as much gas, roughly 15% more than I expected from an engine this size. This is something Mazda has drastically improved in recent years, but remains something to watch out for in their larger engines before 2010.